...and to pitch a book, “From Jailer to Jailed”, he stole from me while he was incarcerated! 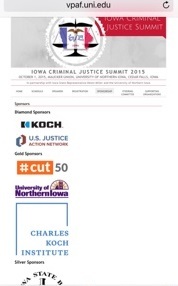 Yes, Bernard Kerik is a featured speaker at the Iowa Criminal Justice Summit 2015. As in classic definition of "psychopath" he has the longest obnoxious resume on the agenda! Ugh! Bernard Kerik gets paid to be flown to Iowa, dress up in his pretty suit and speak for forty-five minutes the same crap whining he's been spewing since mid-2013! It appears all that secret dark money of Koch Brothers into ACCJR.org money is being funneled in all the "right" places. However little is going to pay down Bernard Kerik’s Criminal restitution. He's paying only $1000/mo on a criminal fine of $180,000! I guess crime pays! Corrupt Cop Convicted Felon ON FEDERAL PROBATION supported by Koch Bros and Van Jones Cut50 is allowed to take his lying manipulating self to Iowa. Of course, Bernie Kerik may get to wine and dine all the pretty young thangs in Iowa and gets paid for it! ALERT: Bernie once told me he was going to get a vasectomy and book himself in every college campus across the country to “make up for all he missed in prison”. So a convicted felon still on probation with this kind of mindset gets permission by the FEDS and the UNI administration to visit campus? I guess all that “safety on campus” stuff is apparently ignored at the University of Northern Iowa! Bernard Kerik cheated me out of full rights and compensation to a book I co-authored with him while he was incarcerated. He manipulated $93,000 from me while he was in prison. Felon liar Bernard Kerik, through his attorney and other evil associates, continue to defame me in lies on the public record. Bernard Kerik hasn't changed and is blatantly unrepentant for his crimes. 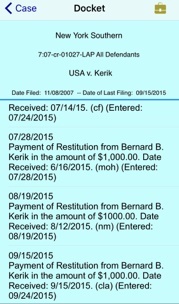 Bernard Kerik continues his deception and masquerade even now during his probation. So we must ask why would the University of Northern Iowa, UNI PRESIDENT Bill Ruud, Professor Dr. Mark Grey, Professor Dr. Michele Devlin, Koch Industries, Van Jones, Iowa State Representatives Deborah Berry, Helen Miller, Chip Baltimore, Mary Wolfe, Iowa Chief Justice Mark Cady and other seemingly sincere, respected and legitimate leaders be supporting a lying manipulating unrepentant scoundrel like Bernard Kerik? Aren’t there felons who have paid their entire debt to society, sought genuine forgiveness and become a true example worthy of a second chance? Bernard Kerik IS NOT!